Once you have made it through the growing season the time has come to harvest the grain from the field. Harvesting is fun and rewarding but can also be challenging. Many growers suggest harvesting your own grain, rather than paying someone to do it, so that you can take your time and harvest carefully. This is especially true if you are growing more uncommon grains, which a hired operator might not be familiar with. For some farmers, this will mean purchasing a new piece of equipment, but even a small combine will do the trick and will probably be well worth the investment. Careful attention to detail during harvesting will save a lot of time during the later stages of processing. Knowing when to harvest your grains is key. 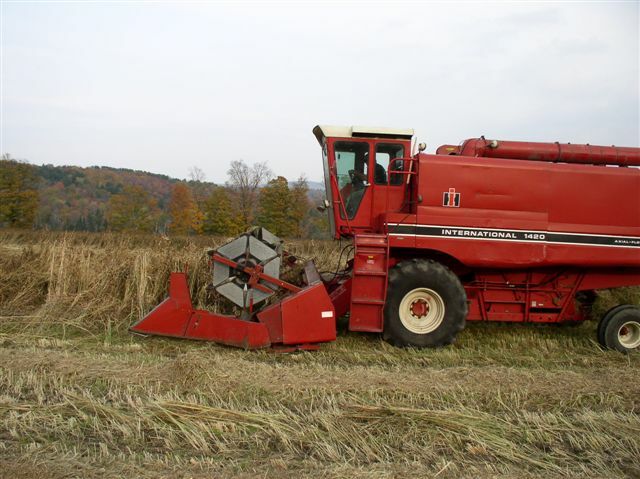 The proper harvesting time will depend on weather, maturity of the grain, and moisture level. Since the desired moisture level at the time of harvest may be different for specific grains, make sure you are familiar with your crop. Some cereal grains are very thick and should be swathed (chopped down) before combining. Learning about the proper equipment and how to operate will save you time and hopefully result in a bountiful harvest. Take the time to adjust your combine’s settings (including speed, augers, and cylinders) to avoid damaged grains. I have to say that I am extremely excited about our latest equipment purchase! Most farmers love to talk shop and compare notes on new steel. Well, I like my equipment too except that it often comes in much smaller packages. Our latest find (thanks to Dorn Cox) was a hand held combine. Yes folks, a mini combine that runs off a 14 volt battery (similar to a power tool). It is light weight and works just like a full size combine. The machine is called minibatt and is sold in the United States through a company called Reichardt electronic innovations (West Fargo, ND). 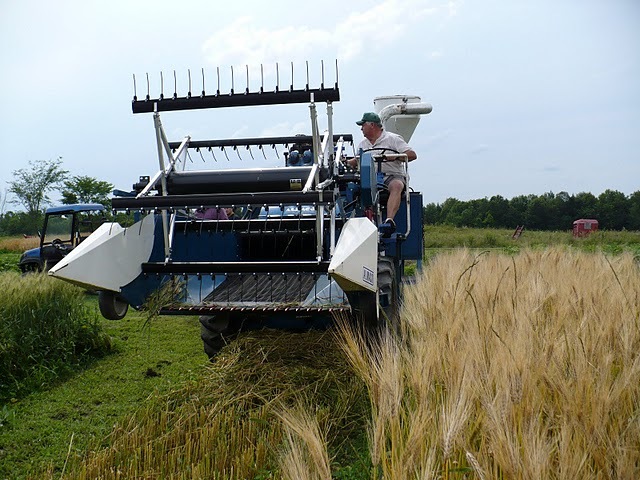 It costs around $800 for the machine that comes equipped with concaves for wheat, barley, and oats. It also includes 2 sample cups, 2 rechargeable batteries, and a charger. Oh yeah, most importantly, it comes in a real snazzy metal carrying case and includes a minibatt hat to wear as you combine your crop! The minibatt was designed for use in Europe. It is primarily used to take samples to determine moisture content prior to harvesting. It is cost saving for farmers as they no longer have to break out the combine to get these samples. I have used the minibatt primarily for our small scale field trials. However it has also come in handy to help farmer’s determine moisture content prior to harvesting their fields. Recently, we decided to accessorize the minibatt and ordered the canola-kit ($250). Since our team was experimenting with canola I figured we must buy the canola-kit (pictured at left). It turns out the canola-kit has actually made the minibatt even more useful to our team. The canola-kit is a hopper that the minibatt can attach to. The plants are placed in the hooper and slowly lowered into the mouth of the minibatt for threshing. It is also perfect to thresh small amounts of wheat or most any grain out of the field. 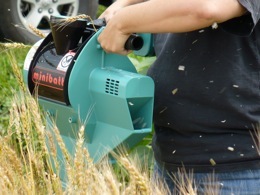 The “minibatt” can thresh one pound of grain every 3-4 minutes. 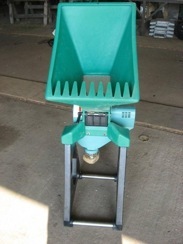 According to the manufacturer it can also be used to combine herb and flower seed. This tool might be very handy for a small scale grain grower or specialty seed producer. Small-scale growers can also harvest with a scythe. Check out the website for Scythe Supply in Perry, Maine for more details.